The promotional image below takes a look at the front of the MB991U3-1SB. It is not all that much wider or deeper than a typical 2.5" drive, but it is several drives tall. It isn't the most compact enclosure I have seen, but it is not necessarily going for small, it is going for tough. The next three images show the enclosure from a few different angles. The entire body is made of steel, with enough ventilation to help keep your drive cool (passively - no fans). 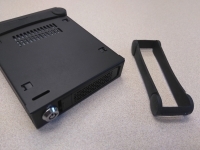 Up front there is an obvious cylinder for the lock, which will keep the removable drive tray securely in place. 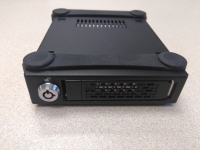 The left side of the drive tray itself has a latch to release it from the housing when unlocked, while the rest of its front face has even more ventilation. Around back, the only feature of note is the bright blue USB 3.0 port which handles data and power for your drive. The below left image shows one of the rubber sleeves has been removed. The sleeve works well as anti-vibration feet for when it is in use on your desk, and they will definitely give the whole assembly some added protection from bumps and drops. 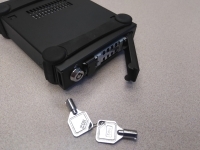 The below right image shows that one of the keys has been used to unlock the drive tray, and that it has been unlatched and slid out slightly. 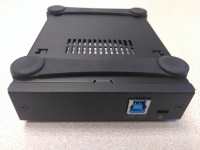 The drive tray removal and installation is very easy, and you get a distinct click to let you know it is in all the way. The image below shows everything that is included with the MB991U3-1SB... 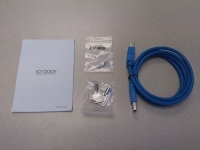 There is a manual, bag of screws, set of keys, and a nice USB 3.0 cable. 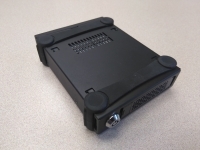 Many enclosures come with a short cable which is barely usable, but this one should give you plenty of flexibility to place the enclosure somewhere convenient.